Join us on Friday, June 7 or Saturday, June 8, 2019 for a night that will bring back memories of sock hops and soda shops featuring The Marcels, The Flamingos, and Pure Gold. Let’s turn back the clock for a night of dinner and dancing and Doo Wop classics! Dinner Buffet at 7 p.m. Pure Gold at 8:15 p.m.
After the performance, stay just a little bit longer and meet the members of Pure Gold. Dinner Buffet at 6 p.m. The Marcels at 7:15 p.m.
After the performance, stay just a little bit longer and meet the members of the bands. 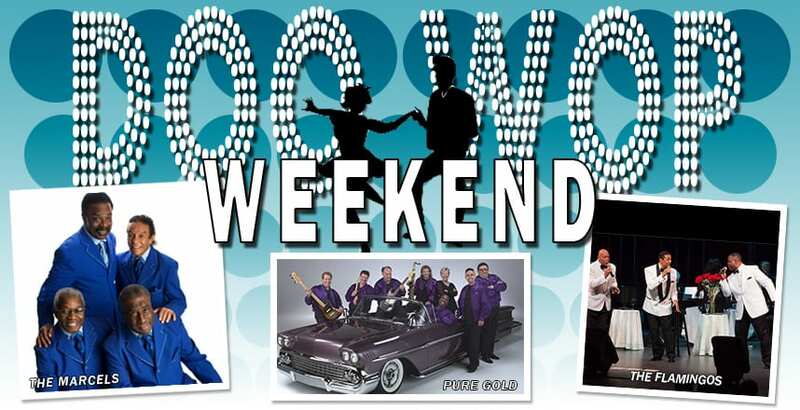 Let’s turn back the clock for a night of dinner and dancing and Doo Wop classics when you stay on the Doo Wop Weekend Package! All attendees must be ages 21 and up. Proper identification will be required at the entrance to the show. Hotel rates are per person, based on double occupancy. Price is subject to change and availability. Advanced reservations are required. Package cannot be combined with any additional discounts, coupons offer or contracted rate. Restrictions apply. Rate does not include applicable taxes or gratuities. Additional fees apply if more that two people are sharing a room. With signature acappella vocals and four-part harmonies, Pure Gold delivers diverse sounds and musical styles with a stage presence that transcends audience ages and backgrounds. Bringing the golden age of American vocal harmony to performances from Radio City Music Hall to The Waldorf Astoria and Rock and Roll Hall of Fame, Pure Gold doo-wops their way through the decades, performing material from the 50s, 60s, and 70s, as well as a blend of blues, standards and original material to highlight their unique talents and range. The Marcels are as advertised, the guys who put the “Bomp” in the “Bomp-A-Bomp” back in 1961 when their first recording, “Blue Moon” sold over two and a half million copies. The Marcels can boast of three record albums, numerous hit singles, with sales in the millions. They also recorded the theme song, “The Greatest Love” for the motion picture, “The Interns” and appeared with Chubby Checker in the film “Twist Around The Clock.” Their signature song, “Blue Moon” has been used in at least four major motion pictures and various TV shows, such as Sha Na Na, Cheers, Moonlighting, Laverne & Shirley, Happy Days, and more! Billboard says The Flamingos are universally hailed as one of the finest and most influential vocal groups in pop music history; their music being defined as elegant and sophisticated. As the group celebrates its diamond anniversary, with their newly released CD, the Ambassadors for Romance are better than ever. Led by Rock and Roll Hall of Fame inductee Terry Johnson, The Flamingos stay true to their roots by performing their greatest hits including, "I Only Have Eyes for You," heralded by The Rock and Roll Hall of Fame as a song that helped define rock and roll. Terry Johnson is lead singer, writer and arranger of The Flamingos' most successful music then and now. As a seasoned performer and former writing and producing partner with Smokey Robinson at Motown Records, his Vegas style shows always provide quality entertainment. The performers with Terry Johnson are dynamic entertainers in their own right and bring The Flamingos presentation into today's market. In live performances, The Flamingos expand their repertoire to include classic songs from the American Songbook arranged in the unique "Flamingos" sound. This mix of classic songs, video presentations and dancers makes for a memory-filled concert that brings fans to their feet repeatedly.